Plastic dinnerware was found in many homes in the 1940s through the 1970s and is highly collectible now. During the 1930s the raw material "melamine" hit an all-time low price. With heightening wartime threats and soon to be monetary constraints, American industrialists jumped on the bandwagon to make melamine into functional products for both commercial and households. 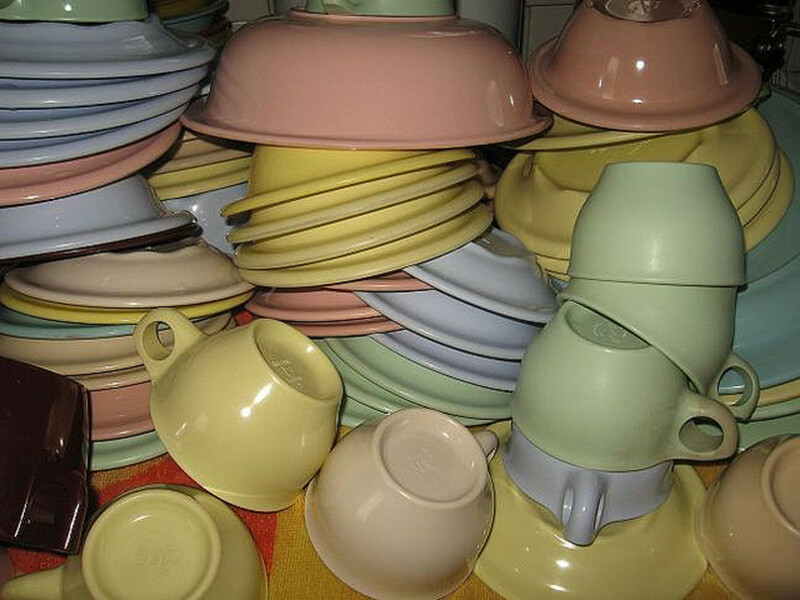 Melamine, a thermoset plastic material was used in many factories and in much dinnerware production by the late 1940s. American Cyanamid was one of the leading manufacturers and distributors of melamine powder to plastics molders. They name-branded their version "Melmac." One of the benefits of molders purchasing from American Cyanamid, was the advertising campaign for Melmac. Just look in any old Life magazines from the early 1950s and you will see how heavily Melmac the wonder plastic was marketed by American Cyanamid There were other manufacturers whom would offer melamine powders for molding (Allied Chemical and PMC Manufacturing to name a few), if a molder were to purchase from a non-Cyanamid distributor they could not refer to their melamine dishes "Melmac." This may be why some old ads for plastic dinnerware specifically say "Made of Melmac" and others may say Plaskon, or perhaps just melamine. American Cyanamid constantly improved their formulas and did extensive consumer product testing and research (even hiring Russel Wright to do a long survey and compile reports in the mid-1940s.) Additionally, American Cyanamid (pre-1960) would send inspectors to certain factories to make sure that Melmac dishes were meeting certain specifications and highest quality standards. The actual material "melamine" was dirt cheap in the mid-to-late 1930s, and there was a push to use this new material for all kinds of things. Entering wartime constraints, plastic was soon to be the wave of the future. 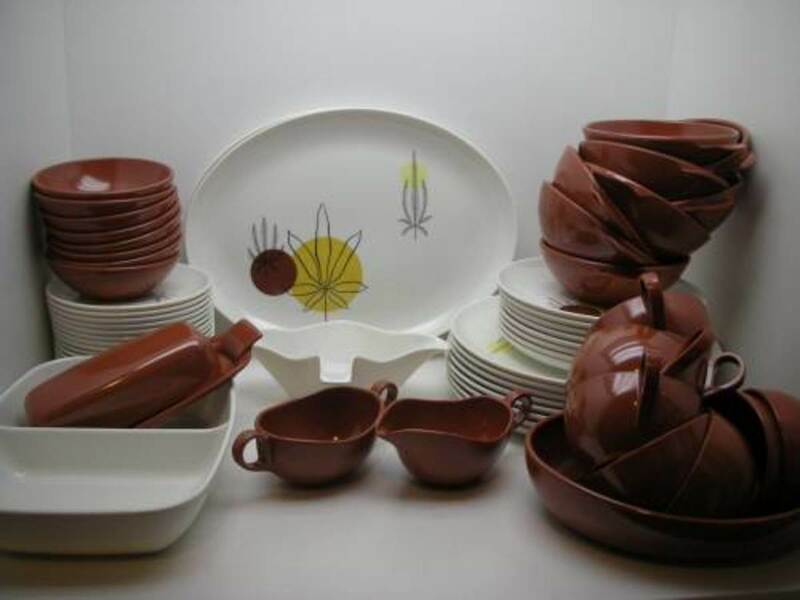 Housewares made of early plastics, resins, and Bakelite did not hold up well or withstand regular washings or heat, but when melamine began in dinnerware production for the military, it proved that this new "improved plastic" could indeed hold up well. Northern Industrial Chemical Company of South Boston: This company founded in 1904 would later take up residence on Elkins Street in South Boston. The company made all kinds of plastics including telephone handsets and electrical components. This company also turned out some of the early Pioneers in Plastics History including Hans Wanders and F. Reed Estabrook. 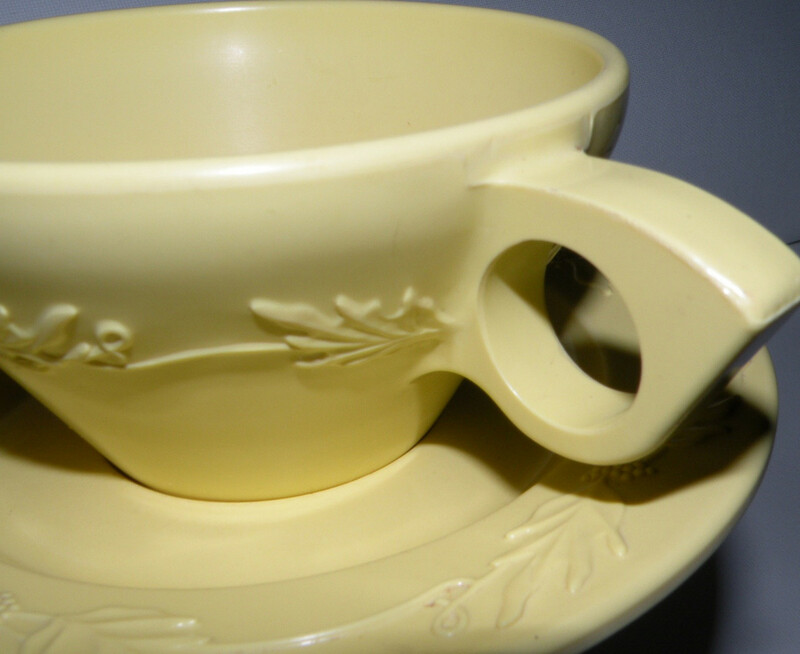 By the 1940s, they were making airline melamine and working on post-war production of molded dinnerware. They were perhaps best known for working with Russel Wright, to produce Residential which made its place into the Modern Museum of Art's collection. Later they would produce his Home Decorators and Flair lines also. By 1962, this company was in serious financial ruin and would later vanish without much trace. Watertown Manufacturing Company of Watertown, Connecticut. This company has ties back to 1915 and made early industrial plastics. Jon Hedu, then-designer worked with the Navy to make military wares. Watertown's best selling Lifetime Ware line would make the Modern Museum of Art's permanent collection (which is cited as being dated to 1940 according to them.) The earliest evidence of this line being available to consumers was 1946 according to Plastic Living. Ironically, this company would sell out the dinnerware division to Northern Chemical Company (above) circa 1960. Hemco Plastics became a division of Bryant Electric Company Bridgeport, Connecticut, in 1928. Electrical components, industrial parts for washing machines (Westinghouse), and early Hemcoware kid's dishes were some of the staples produced here. Ironically having ties to Westinghouse made it convenient for molding everything from plastic stove knobs, to later branded Melmac Dishes. 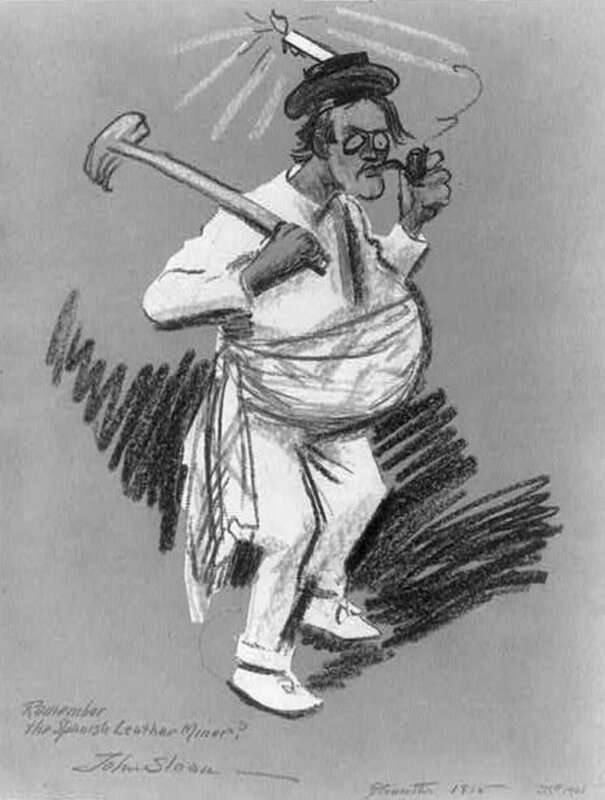 Examples of this line are in the Modern Museum of Art's permanent collection. By the late 1940s, there were many molders making melamine dishes including Boonton Molding of Boonton, New Jersey (Boontonware) and PMC Manufacturing Company of Dallas, Texas (Texasware). 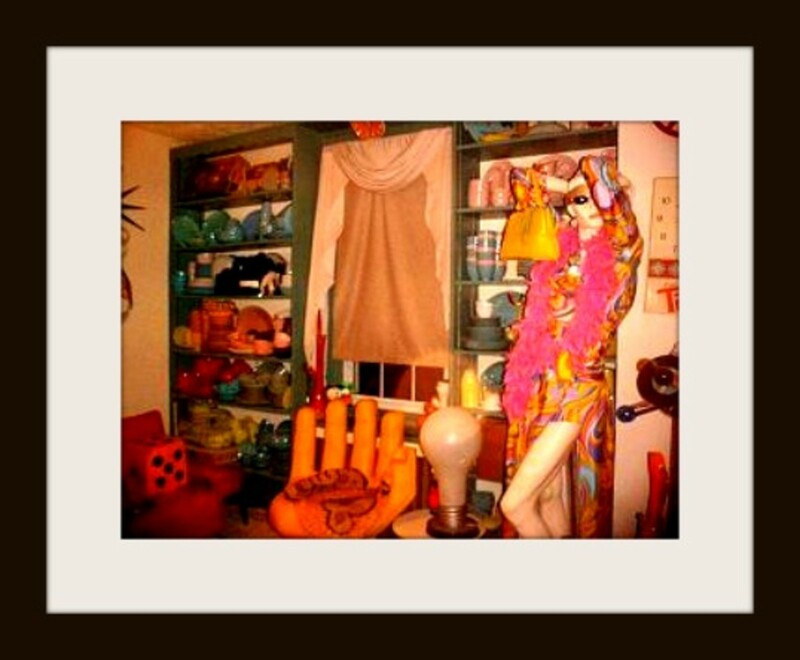 Vintage Melmac is still plentiful to find at thrift stores, estate sales, online auction sites, and sites like Etsy. Cleaning Melmac, however, is another task. I would not let a set of dirty Melmac deter you from buying; it can be cleaned for use or display purposes with a little effort. Melmac can't be microwaved or it will shatter, and shouldn't be used on the stove or it will discolor and burn. This is why some will find sets with burnt edges, or the bottoms of the plates burnt. Unfortunately, over time the dishwashing harsh agents did remove some of the "sheen" or "shine" on old melamine dishes. If you are using vintage Melmac for a display, you can shine it back to life. 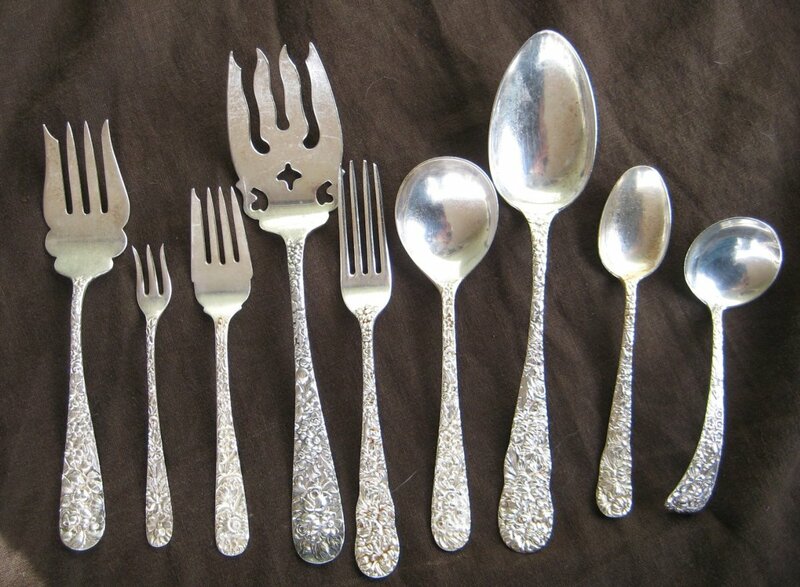 It's great for picnics in the summer and looks great in your vintage kitchen for dinner. Avoid heavy steak knife usage though to avoid deep scratches. It's fun to collect it and due to its long production easy to make a whole set. Some Melmac is worth more in value than others as some of it was made by top designers at the time. Full sets in pretty 1950s colors such as pinks or blues are generally priced higher and still sought after. Finding sets of pink grows harder anymore. 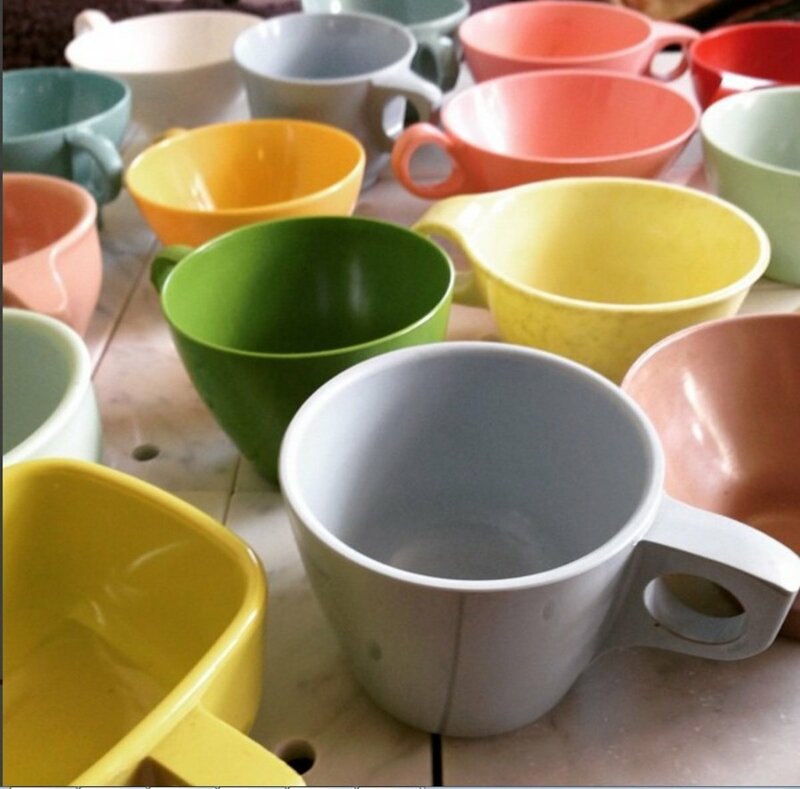 As a rule of thumb, the Melmac from the 1940s to the 1950s seems to be more sought after; not only for the age of the item but for the pastel and bright colors, some with speckles, that they produced. The Melmac of the 1960s to 1980s was set to mirror the design trends. You will see more brown, tans, olive green, and mustard yellows. This is not as sought after, but the orange of the same era seems to be hard to find. White melamine is subjective, as most was badly stained or shows knife marks making it hard to find. Color-Flyte in white is highly collected, and depending on the style, it could be sought after by collectors. For instance, rare is finding pieces made by Lucent, or Russel Wright Residential in white speckles, which eludes even me. Floral lines and prints are plentiful, and many various flowers and floral lines exist. Collecting a set could be fun, and inexpensive to do. There are examples to every rule, however, the set below was designed by Joan Luntz for Brookpark, and is part of the Fantasy line, and is rare. Even though it's brown, and otherwise would be considered undesirable, it's rarity makes it worth its weight in Melmac. Rare makers like Lucent, Fostoria (both glass companies that dabbled in melmac), Russel Wright and Raymond Loewy (both mid century modern designers) are highly sought after. Women designers also were known for their creations, as Joan Luntz designed for International Molding Company who made the modern Brookpark melamine. Boontonware made in New Jersey seems to be a household favorite, and the flowing Boonton Belle line was designed by Belle Kogan, a woman designer, from Russia born in 1902. Collect what you like. Full sets are sometimes hard to find, but you can start inexpensively piecing sets together that you think are cool or fun! 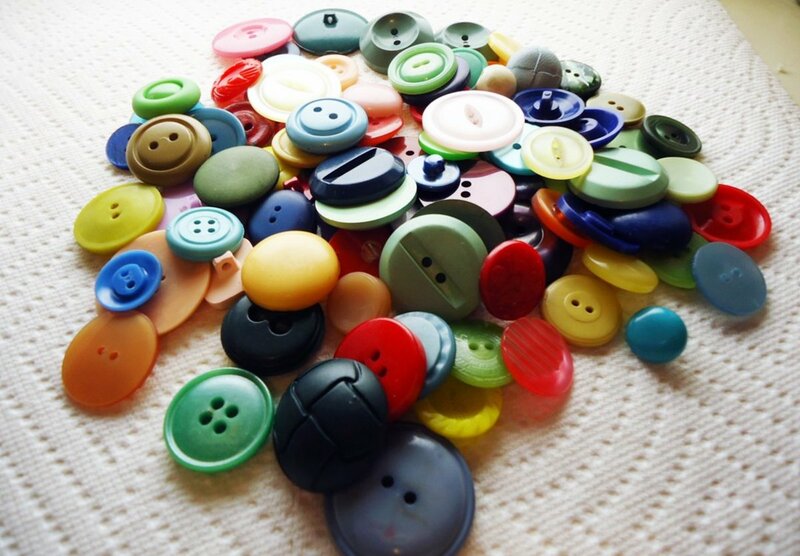 There are so many makers, lines, patterns and colors that you could easily start whatever moves you. One can easily start a pink set, but even after twenty pieces realize that if comprised of many manufacturers each may be off a slight hue off in color. Decide what lines you like best, and go from there. Boontonware, Brookpark's Modern Design, Texasware, Branchell's Colorflyte and Watertown are still plentiful and turn up often, even their earliest designs. I assume this was due to the sheer amount and popularity produced. 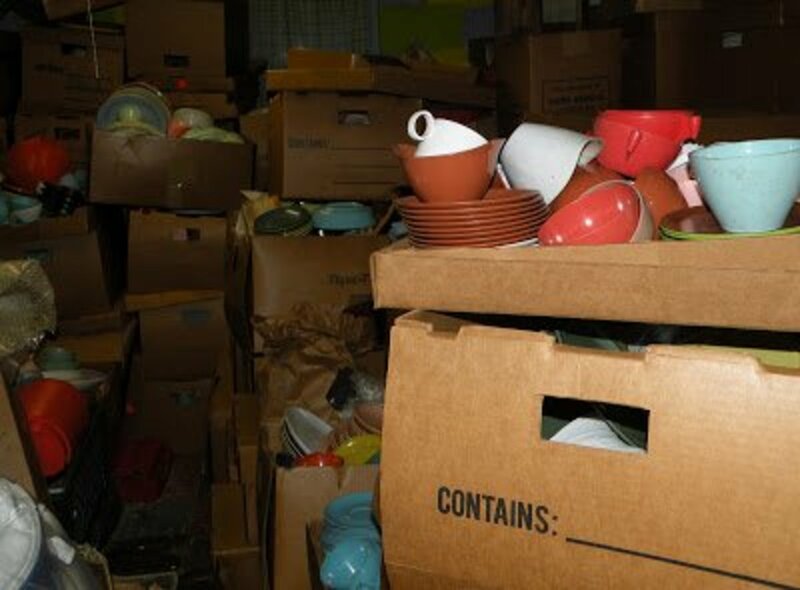 You will also find a lot of later '70s Melmac and early 80's Allied, Lenox/Lenoxware, Dallasware, TexasWare, and Oneida are still floating around. Look at local thrift stores, church bazaar's, on auction sites like eBay and vintage sites like Etsy. Be aware with so many makers and manufacturers that assembling collections may be hard to do, and no two pinks seem to be alike! The hunt is fun! Melmac Is Waiting to Be Found! The Melmac I collect, Russel Wright's Residential Line of Melmac, had recently been reproduced by designer Michele Yeeles, owner of "Bob's Your Uncle" in conjunction with Russel Wright Studios, and was being distributed out of Boston, Massachusetts. Ironically, their headquarters was very close to the original location of Northern's factory in South Boston where the original dishes were made over 60 years ago. New molds were made to reproduce the original shapes, and colors very similar. This goes to prove this melamine is design worthy and will withstand the test of time. Colors are very close to the old, and this gives new collectors of today an opportunity to assemble a set. 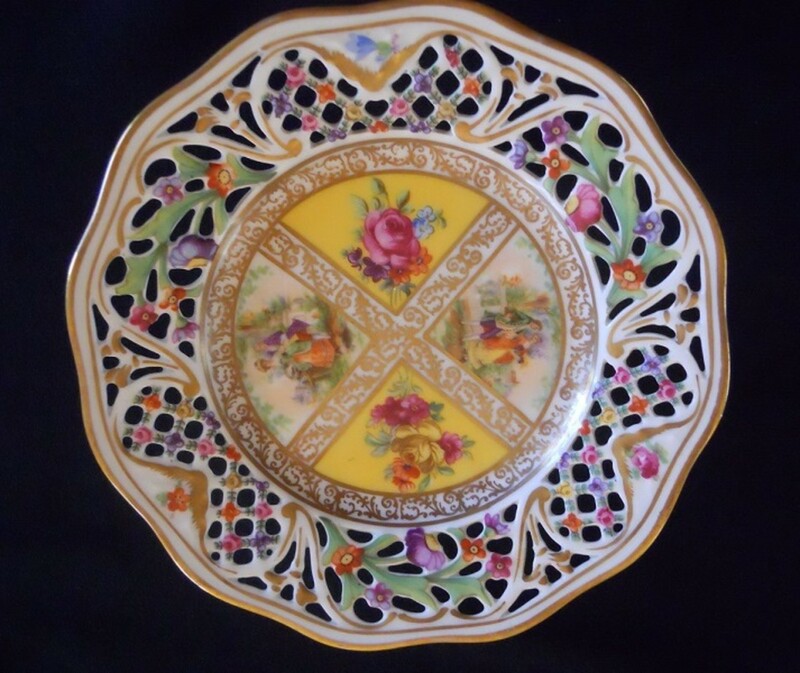 Do your diligence to research if you have new or reproduced melamine. Many commercial lines of melamine dinnerware are still being produced to this day, and are molded in the same shapes as vintage. The Prolon factory is still in business, and still makes shapes for restaurants and industry today. This book, published in 1997, is the one that got me into collecting. It shows a lot of makers and a bit of history. If you desire paper books, a used one can be found on Amazon. 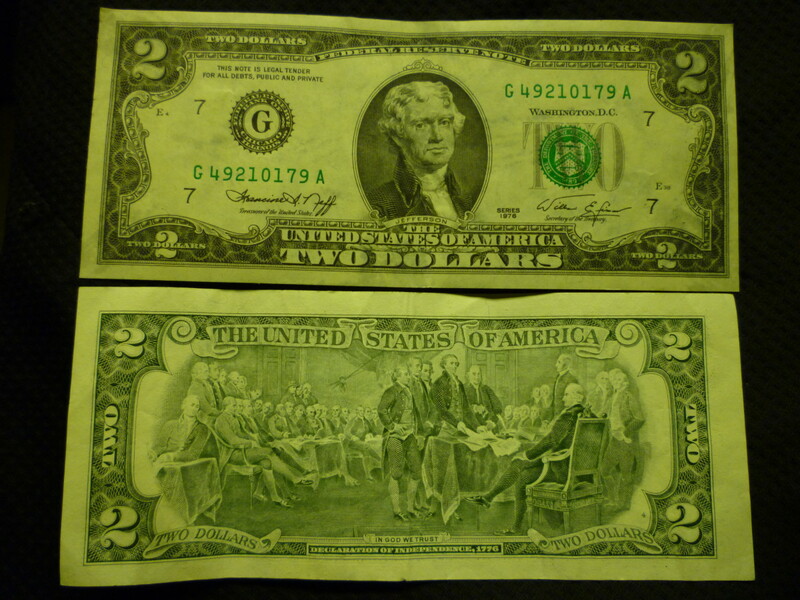 How Much Is a Two Dollar Bill Worth? Please leave me some comments or tell me about your melmac collection! My dad was a foreman in the St. Louis plant. I visited many times for the Christmas potluck and was intrigued by the process. The giant presses were scary but the workers seemed to take it all in stride. Our kitchen cabinets (which my dad built) were often full of mismatched pieces because dad would periodically bring home a box of "seconds". Today, I have a small collection - focused on the ColorFlyte collection. BUT my prized set is the pale blue demitasse cups and saucers my dad gave me. Have never seen them anywhere else - ever. I would love to know if anyone else has ever seen them. I am a huge Boontonware fan! I would love to find a catalog, or salesmans list of products, any ideas where i might find one? how much is a Brookpark Arrowhead cream and sugar worth. I have some Oneida ware, which I think is Melmac. I dropped and broke a couple of them. I would love to replace them. There is some numbers on the bottom. I tried Googling 'Oneida ware' along with the numbers, but no luck. Wish I could include a photo. I inherited my grandmother's prolon ware that she collected by buying laundry soap. I love mid century modern and in the last few years I have fallen in love with melmac. I mostly have picked up odds and ends for very little money. Recently though I got this set. I bought it to sell but I really like it so we'll see☺. I wish I could send some pics! I've never seen this pattern before. I got it in the original box. It's duraware and the pattern is Indian song cocoa. I got 28 pcs of it. I inherited from my Aunt two large boxes, with 12 small, unopend boxes from the 50's of melmac. Sun-Valley Melmac by stetson. One place setting in each box, golden wheat. I have a lady that wants to buy them, not sure what they are worth. Anybody that could help me? Thanks! Does anyone know anything about Gothamware? I was cleaning out my mom's shed and ran across a small yellow mug that says "Gothamware Made in USA" on the bottom. From the size I think it might have been from a children's play set. It's plastic and I'm guessing it's Melmac, since it's sturdy, although I could be wrong. I just bumped into your amazing, well-researched, and charming site. You really know your stuff. I've been collecting Melmac since the mid-1970s, and have several boxes full of the usual: a wide-ranging group of miscellaneous pieces besides my focuses, which are pieces by R. Wright in his various patterns and companies (including some of his Japanese stuff); Florence Prolon; Arrowhead and its successor, Brookpark "a modern design"; and my favorite, Branchell, from Color-Flyte through Royale (and, ultimately, plain, old Branchell). I don't know of any other set besides Branchell that did it all -- two sizes of tumblers (that fit together perfectly for easy storage), serving pieces from small to huge, individual ashtrays, group ashtrays, handled bowls, salad serving sets, and flatware (really unique among the Melmac offerings, I think, although you may know of other companies that produced matching flatware for their Melmac dishes sets). The eight mottled colors are really a palette for the fifties. Finally, I can't help but noticed that you, too, are from West Virginia, a fellow traveler, although you're in the booming and refined eastern panhandle, and I'm way down in the southern part of the state, five or more hours away. Anyway, thanks for doing all you do and doing it so well. Fabulous to read all this information about Melmac. I have my mother's Btanchell Co. Melmac and my grandmother's Royalon Inc. Melmac. Great history! My grandfather started Plastics Mfg. Co. in Dallas in the late 40s - my father ran the company until his death in 83. For many years it was the largest manufacturer of melamine dinnerware in the world, as well as the only plastic dinnerware sold at Neiman-Marcus! I worked in the outlet store while in college in the early 70s so I may be able to answer some TexasWare/DallasWare questions. 511c 40 or 4Q is it worth any thing. I enjoyed this article. I was unaware of the history of the product. As a collector, I will start to keep an eye out for this. Thanks. Related to Kathy's question, if it's not too late! I just went looking for Pyrex and somehow came home with melamine, including 7 bowls -- all aqua and all shelved together. Two are matching Texasware. The rest I thought were a set unto themselves, 2 small, 2 a little larger and 1 a little larger than that. But I realize the largest is probably not the same as the others. It is marked with only a tiny "B." The other four, like Kathy's are marked simply with a small or superscript 10 and 7415, 7415 and a small 15, and two smallest are 7405. Thoroughly useless but I'm putting it out there in case anyone else stumbles on this page and comments as I did! Do you know where the Windsor line was manufactured? Take a look... I guess you will enjoy! That is funny. Lots of ferny-like patterns came out in the sixties. Keep looking on ebay and etsy and you may find out the pattern name. You can also do a search for Lenoxware ads and see if you can find it in an old advertisement! Those are mold markings, meaning the number of the dish as it was placed in the metal mold. 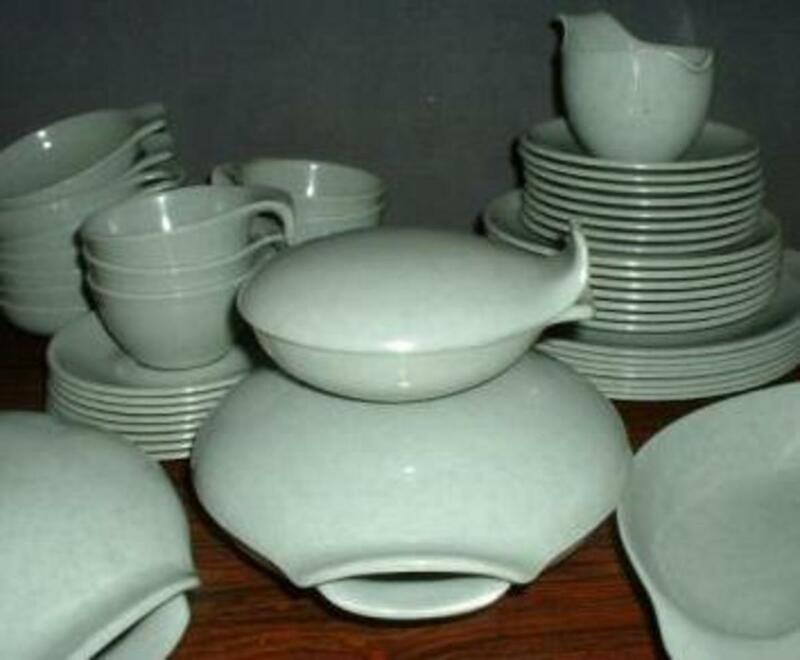 Texas Ware, Boonton and most major factories used them. It may be hard to find a match but keep looking. Where are you? I need to talk to you! Look me up at http://www.MemacCentral.com and email me! Pam, best thing to do is look up ebay and etsy, and find a happy medium, and you may even find the name of your set! If you can't find the exact set your mom may have a less produced item therefore more value. 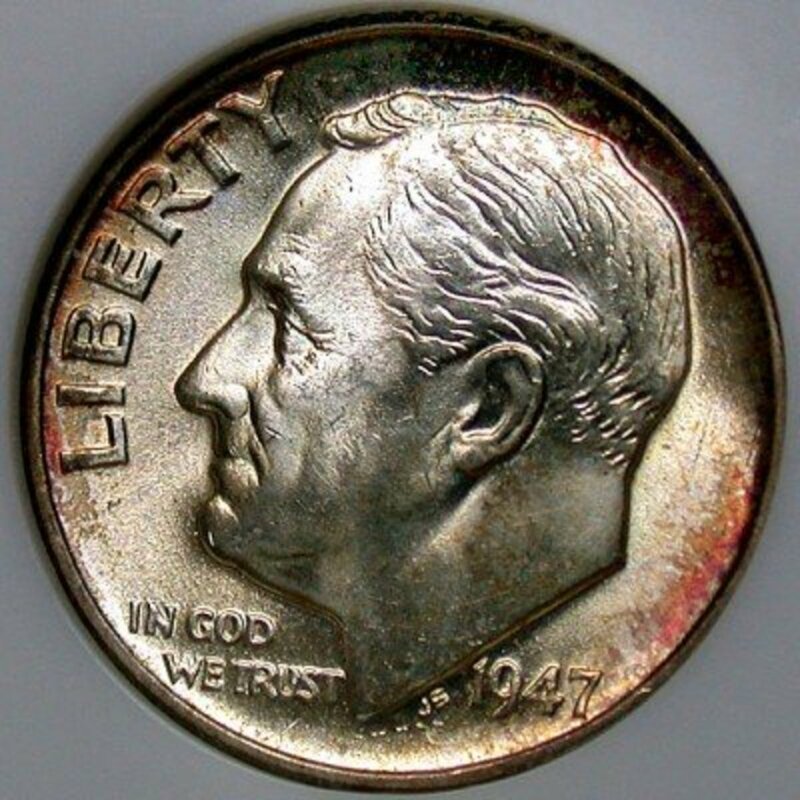 However, that's subjective if the set is used, chances are it may have scratching or dulling, and this will retract from the collectiblity value. Supply and demand is driving the prices now. I have a single dessert/sauce bowl that measures about 5 inches across and 1 1/8 inch deep. There is no company name listed, just the number 7405. How can I find out who made this? I've been searching on eBay and Etsy. Lots of pink bowls but not like this one. I did find a single brown bowl but the person is unable to take questions about their product. information can be found online compare at ebay, etsy, auctions, and collectible guides and of course, condition is very important. Must have been all that formeldehyde they were huffing! Allied Chemical did put out their own melamine for awhile, even though they did also make the melamine powers. 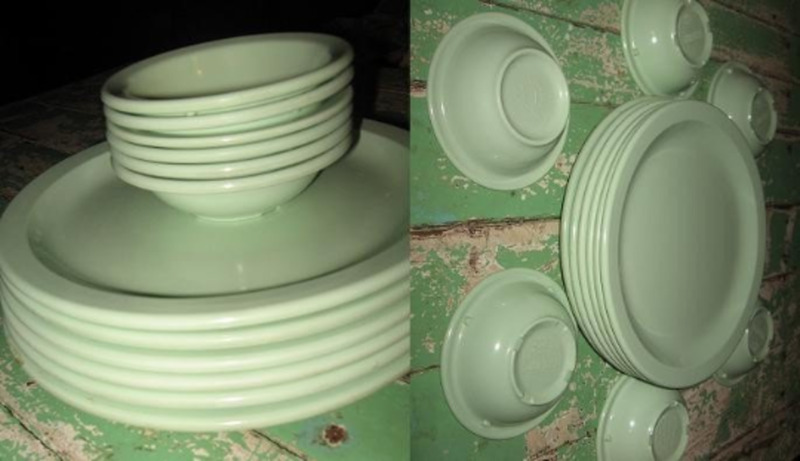 I love old melmac dishes, reminds me of the texasware my mom used to have. Thanks for writing this post! Great article! http://melmaccentral.com is this your site? I love this information thanks for all you do for plastics. I want to say I am a big fan of the http://RetroChalet.blogspot.com site and thank u for all the free information. Nice job, you melmac diva you.